The Legal History and Rare Books (LH&RB) Section of the American Association of Law Libraries (AALL), in cooperation with Cengage Learning, announces the Ninth Annual Morris L. Cohen Student Essay Competition. The competition is named in honor of Morris L. Cohen, late Professor Emeritus of Law at Yale Law School. The competition is designed to encourage scholarship and to acquaint students with the AALL and law librarianship, and is open to students currently enrolled in accredited graduate programs in library science, law, history, and related fields. Essays may be on any topic related to legal history, rare law books, or legal archives. The winner will receive a $500.00 prize from Cengage Learning and up to $1,000 for expenses to attend the AALL Annual Meeting, scheduled for July 15-18, 2017, in Austin, Texas. The entry form and instructions are available at the LH&RB website: http://www.aallnet.org/sections/lhrb/awards. Entries must be submitted by 11:59 p.m., April 17, 2017 (EDT). One of our outstanding acquisitions of 2016 was a lovely calligraphic manuscript with a hand-painted image of Lady Justice. The image was the unanimous choice to adorn the Lillian Goldman Law Library’s 2016-2017 holiday card. The manuscript is titled Der Reichs-Stadt Kaufbeuren Gerichts-Ordnung. It is a comprehensive guide to court procedure in the imperial city of Kaufbeuren in Bavaria, dated 1756 and authored by a local judge (“Gerichts Assessor”), Georg Friedrich Heinzelmann. 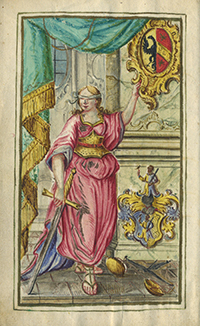 The image depicts a blindfolded Lady Justice with her left hand resting on the coat of arms of Kaufbeuren. The identification coat of arms in the lower right of the image had me and some of my colleagues stumped. One book dealer friend speculated that it might have some connection with St. Francis of Assisi, because of the figure with a bird in his hand. Not being familiar with this type of research, I made a number of Google image searches based on guesses, none of which uncovered an answer. However, one of the recipients of our holiday card has come to the rescue. My friend Michael Laird, a rare book dealer in Lockhart, Texas, identified the arms as those of the author’s family, Heinzelmann, and helpfully provided the source as proof: Neubecker, Grosses Wappen-Bilder-Lexikon, p. 134. Thank you, Michael! The Rare Book Collection is honored to be the recipient of a bequest from the estate of Professor S. F. C. Milsom (1923-2016): the 1561 Richard Tottel edition of the Novae Narrationes. What makes the gift special is the stature of its donor, the book’s connection to Milsom’s career, and Milsom’s connection to the Yale Law School. Professor Milsom (“Toby” to his friends and family) has been called the “dominant intellectual voice in English legal historiography” for the last fifty years by his colleague David Ibbetson. In a eulogy to Milsom, Sir John H. Baker said, “He was perhaps the last writer in legal academia whose works could be regarded as literature.” Milsom is best known for his groundbreaking book, Historical Foundations of the Common Law (2nd edition 1981). 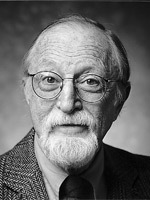 Milsom’s first publication in legal history was Novae Narrationes (1963), Volume 80 in the Publications of the Selden Society series. The Novae narrationes was a collection of model oral pleadings (“narrationes” or “counts”) which initiated litigation, dating from the reign of Edward I in the late 13th century. As Milsom described them, “The count became the formal opening gambit in a game in which many moves were possible, and dexterity in making these moves became the preoccupation of the bar.” The 1561 printed edition of the Novae narrationes was the last of four printed editions. The volume’s immaculate condition suggests that Milsom did not use it in his original research for the Selden Society volume, but he knew its contents intimately and it undoubtedly held a special place in his affections. Lesley Dingle and Daniel Bates provide a thorough and lively account of Milsom’s career in the Eminent Scholars Archive of the Squire Law Library, University of Cambridge. It includes a bibliography of Milsom’s writings and videos of his oral history interviews. The book itself is a fine copy. It boasts a Riviere binding and the bookplate of Thomas Jolley, whose enormous book collection was dispersed in a series of Sotheby’s auctions from 1843 to 1855. It consists of three works: (1) the Novae narrationes; (2) Articuli ad narrationes novas, a commentary on the first work, and (3) Diversite des courtes & lour iurisdictions, a guide to court procedure. All of these would have been useful works for a practicing lawyer, and the small format would have made the book handy in court. The table at the end of the second work has been annotated in an early hand; see the image below. One final point of interest… The book was published by Richard Tottel, who held the patent for printing English law books from 1552 to his death in 1594. 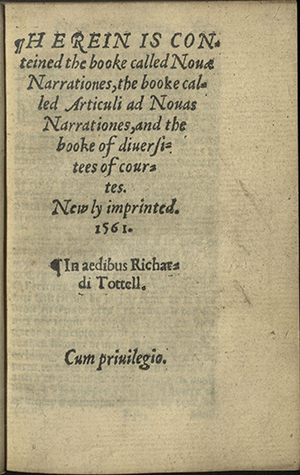 Among other things, Tottel is known for spelling his own last name 11 ways, including two different ways in this one book: “Tottell” on the title page and “Tottil” in the colophon. The Law Library thanks Mr. Charles Perrin, the administrator of Professor Milsom’s estate, and Sir John Baker for their help in effecting Professor Milsom’s bequest.